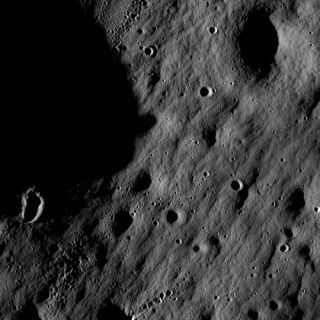 Cratered regions near the moon's Mare Nubium region, as photographed by the Lunar Reconnaissance Orbiter's LROC instrument, in a region 1,400 meters (0.87 miles) wide. NASA?snewest spacecraft in orbit around the moon has sent its first snapshots of thelunar surface. ReleasedThursday, the images from NASA?s new LunarReconnaissance Orbiter reveal a moon bathed in light and shadow in a regionknow as Mare Nubium, or the Sea of Clouds. They were taken by a pair of camerasthat make up the orbiter?s high-resolution imaging system. "Ourfirst images were taken along the moon's terminator - the dividing line betweenday and night - making us initially unsure of how they would turn out,"said Mark Robinson, the principal investigator for the Lunar ReconnaissanceOrbiter Camera (LROC) at the Arizona State University in Tempe. Two of thenew images were taken from a larger strip of terrain observed by the spacecraft?sLROC eyes. They are NASA?s first clear, up-close look at the moon in a decade,though the orbiter?s partner probe beamed home grainyviews from much farther away when both spacecraft arrived at the moon onJune 23. Ultimately, the Lunar Reconnaissance Orbiter will build new globalmaps of the entire lunar surface as it orbits the moon. The imagesreleased Thursday show cratered regions that span an area just under a mile (1,400meters) across. In some parts, the shadows are so dark that surface details arecompletely obscured, while in others the stark contrast between night and dayreveal dramatic views of the moon?s craters and battered surface. "Becauseof the deep shadowing, subtle topography is exaggerated, suggesting a craggyand inhospitablesurface,? Robinson said. ?In reality, the area is similar to the regionwhere the Apollo 16 astronauts safely explored in 1972. While these aremagnificent in their own right, the main message is that LROC is nearly readyto begin its mission." NASAlaunched the Lunar Reconnaissance Orbiter and a smaller impactor probe towardthe moon on June 18. The powerful orbiter will seek out potential landing sitesfor future astronauts, as well as build new maps of the moon?s surface,temperature extremes and radiation environment. It will also hunt for water icein the permanently shadowed craters of the moon?s south pole. The orbiter?spartner craft, the Lunar Crater Observation and Sensing Satellite, zippedaround the moon on June 23 and is due to purposely crash into a shadowed crateron Oct. 9 in the hope of finding definitive proof of water ice. The impactorprobe is attached to a massive, but empty, rocket stage, which it will sendplunging into the crater first, scan the resulting crash and plume for waterice, then perform its own death dive four minutes later while telescopes inspace and on Earth look on.